At first, there were only a few people. By 8:30, there were a handful of surfers and some Asian families. I counted maybe 20-25 people, all in the ocean and none on the beach. I laid down and closed my eyes. At about 9 am, I looked up and all of the surfers and all of the families were gone. There was no one in the water. There were three of us on the beach. About 40 yards to my right was a blonde, Western female sitting on the beach alone. About 30 yards to my left was a blonde, Western female sitting on the beach alone. 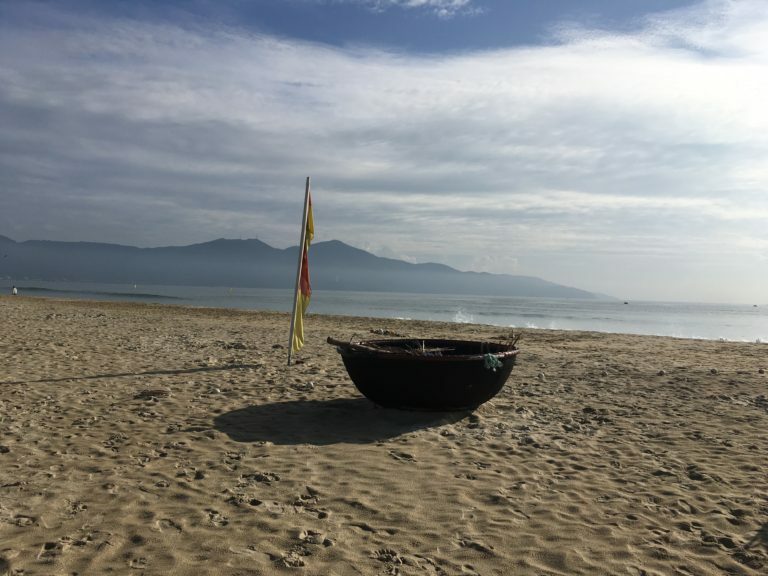 I just thought it amazing that at one of the most popular beaches in Vietnam, in this section of beach, the only three people were solo, Western females. It was pretty cool. That lasted about three minutes before some more couples and families arrived. 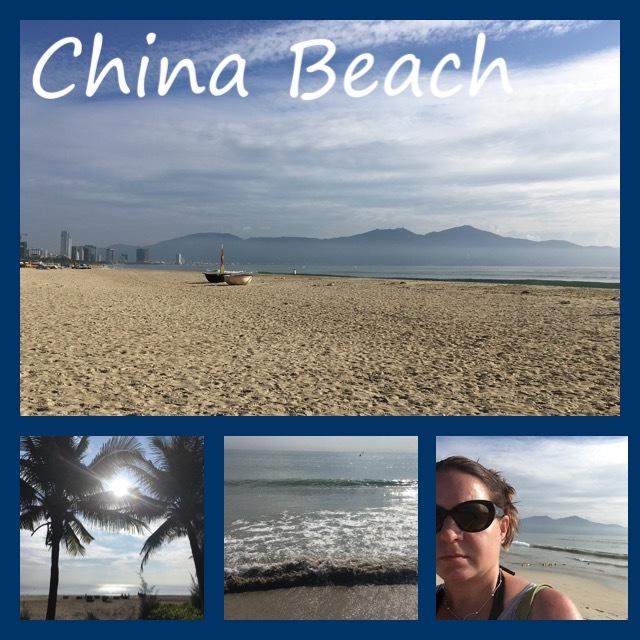 I stayed until 9:45 and then headed back to my hotel to be able to shower and pack at a leisurely pace before my train to Nha Trang. 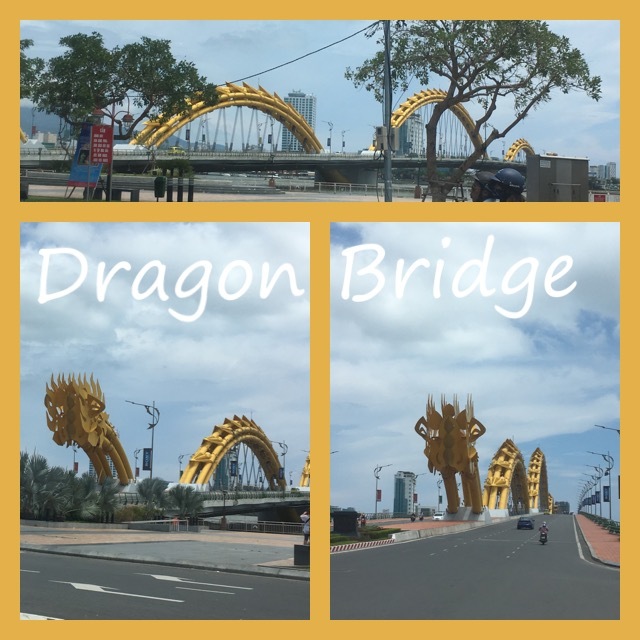 On the way to the train station, I was thrilled to drive by the fabled Dragon Bridge. I had seen it from afar from the next bridge over on the back of Bill’s motorbike, and I saw it from an even farther distance from my 11th-floor hotel room (where I could also see Monkey Mountain and the beach), but up close was even better! I had quite an experience on the train and made a new friend who wanted nothing more than to practice her English. She’s a total sweetie, and I’m so glad I got to know her! So glad you had a great day and your new friend looks like a sweetie. Love you and safe travels. A total sweetie! Love you, too, Moms! Ooh, the Dragon Bridge is cool! Mal will love that! Awesome pics; especially love the bridge! 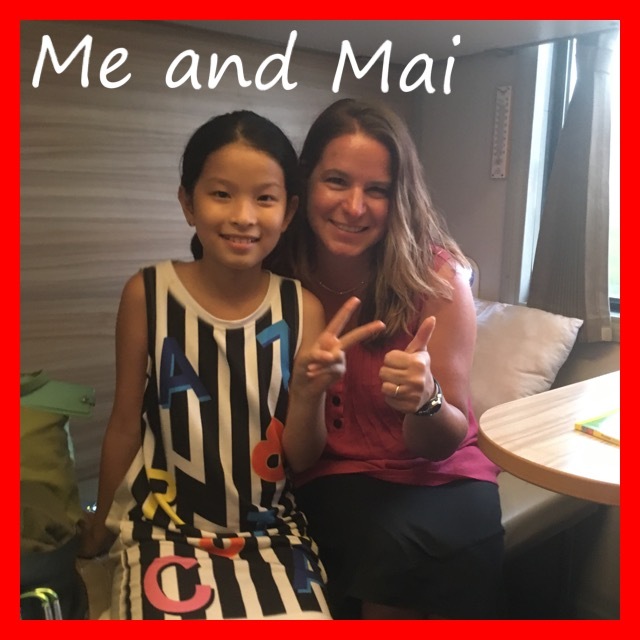 Awesome pics and your new friend Mai is lovely! She really is lovely, and her English was excellent. She made the train ride so much more enjoyable! Her whole family was nice. She was traveling with her grandma, uncle, aunt, aunt’s friend, brother, and three cousins (or “baby uncles” as she said before I taught her the right word). The uncle, aunt, and aunt’s friend kept coming in to check and make sure she wasn’t tiring me out. I assured them that she wasn’t! Bonnie and Mary, the bridge was all sorts of awesome. It’s supposed to be something at night all lit up. I had planned to try to see it at night, but that just wasn’t happening. And I didn’t realize I could see it from my hotel window (albeit not very well) until right before I was checking out. Beautiful beach, beautiful bridge, beautiful new friend! Mai definitely sounds like a sweetie. I wish she had email so I could keep up the correspondence (I asked; she didn’t), because she is a sweetie, and she’d be so fun to be friends with!